Breast of Veal Stewed Whole Cut a piece off each end; make a force meat as follows: Boil the sweetbread, cut it very small. some grated bread, a little beef suet, two eggs, a little milk, some nutmeg, salt and pepper; mix it well together and stuff the thin part of the breast with some of it, the rest make up into little balls and fry; skewer the skin close down, flour, and boil it in a [cloth?] 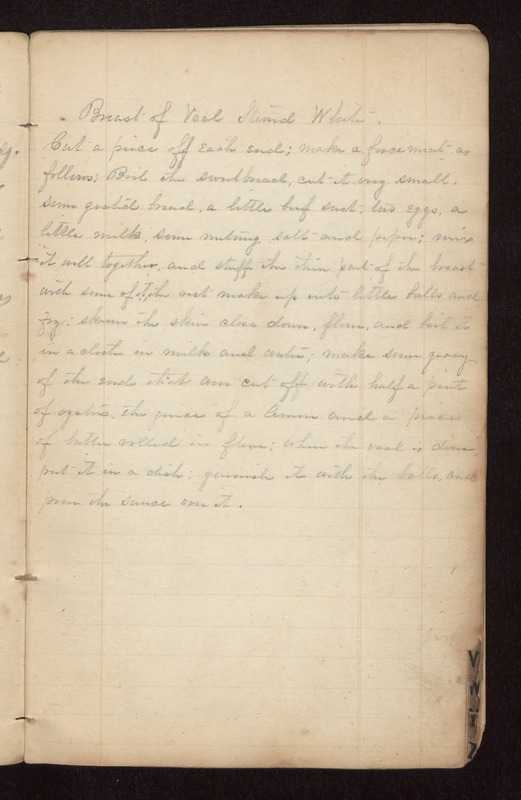 in milk and water; make some gravy of the ends that were cut off with half a pint of oysters, the juice of a lemon and a piece of butter rolled in flour; when the veal is done put it in a dish; garnish it with the balls, and pour the sauce over it.